LG Announced Optimus One and Optimus Chic Android Smartphones: LG Electronics recently unveiled not just one but two Android-powered smartphones namely Optimus One and Optimus Chic. I know that you are thinking about Transformers upon reading their names but the phones are not in any way related to those robots or the movie. According to LG, the name was taken from the Latin word "optimus", which means best. Will these smartphones eventually become the best among the rest? Only time will tell, I guess, since we don't have enough information regarding the hardware specifications, performance, and features of LG Optimus One and Optimus Chic. What we do know however is that they will both run the latest version of the Android operating system codenamed "Froyo". Since the LG press release doesn't say much about the LG Optimus One and Optimus Chic, we will give you some rumors about the specs. According to Boy Genius Report, Optimus One will feature a 3.8-inch display, a Texas Instruments ARM Cortex-A8 OMAP3630 processor, an HD camera, and HDMI/DNLA support. 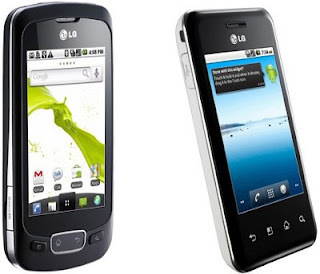 The Optimus One and Optimus Chic are not the first Android-powered smartphones released by LG. Their first phone that runs Android OS is the LG GW620. The girls, I mean the phones looked gorgeous, aren't they? Is it just me, or are the girls hands doctored up to look bigger(and thus the phone to look bigger)?? ?